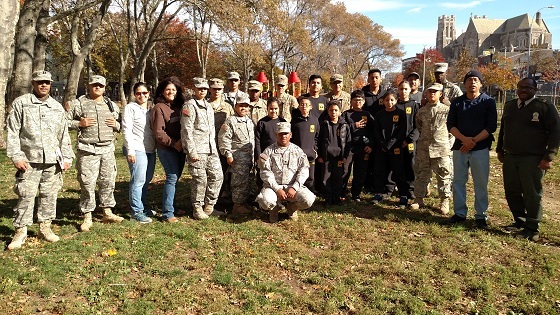 Bronx REACH CHAMPS Parks & Open Spaces Coalition members Bronx Community Health Network, Fordham Hill Owners Corporation, Montefiore, New Yorkers for Parks and the NYC Parks Department joined forces with the kids from the Washington Greys Military Academy on Saturday, November 5 at Devoe Park to clean up, pull weeds rake, and plant 1,000 daffodil bulbs courtesy of The Daffodil Project. Check out some highlights from the Daffodil Planting Party in the video below. The Daffodil Project was founded in 2001 as a living memorial to September 11. With nearly 6 million free bulbs planted citywide by more than 100,000 young students, parks and gardening groups, civic organizations, corporate volunteers and other New Yorkers, it is one of the largest volunteer efforts in the city's history.